Warwick Castle is one of the best preserved castles in England and there’s plenty to see and do when you visit because it’s had plenty of money spent on it as part of the Tussauds group of attractions. There’s more on the entertainment experiences in a moment, but never forget that the building itself is the real star here. It has luxurious historic rooms laid out as they would have been in the castle’s heyday in the time of the Earls of Warwick. The other big attraction for us was walking the walls where you feel like you’re either on a movie set or part of the history of the place. You get a great view of Warwick and the surrounding area too. The kids in particular wanted to climb the next winding staircase to see where it led. We also enjoyed a trip to the lovely water mill at the bottom of the castle walls which is easy to miss. When it comes to the entertainment, a lot of money has been spent ranging from trebuchet demonstrations to hand to hand combat. All of it is very well done and big crowds do gather to see it. Our kids particularly enjoyed the birds of prey demonstration which takes place in a ringed area within the grounds. On top of all the attractions that are included in the admission price, there are also two additional ‘experiences’ that you have to pay extra for on top of the basic castle entry. One of them is the Castle Dungeon, where you’ll find gore, torture, decaying bodies and chanting monks along with the labyrinth of lost souls! It’s not suitable for under 10s. The other is the Merlin & the Dragon Tower which is an experience based on the BBC TV show ‘Merlin’ which includes an exploration of Camelot and an encounter with a dragon. When you consider that the main attraction is still the castle, the price to enter does seem steep, but if you make the most of all the things you can do it would be easy to spend a whole day here. We did think it was a shame that you had to pay extra for the Dungeon and the Dragon Tower though. There are a range of admission tickets depending on what you want to have included. Adult admission to the castle including the Dungeon and the Dragon Tower is currently £33.60. Adult admission to the castle without the extra experiences is £21 (2011 prices). You can save money by buying online in advance here or by collecting the many vouchers which offer 2 for 1 admission. These are commonly in UK supermarkets or national newspapers. 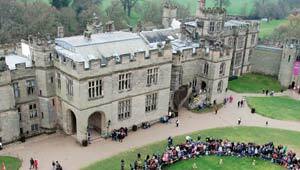 Warwick Castle is open in the summer from 10am until 6pm (April to October) and in the winter season from 10am until 5pm. While at the castle, try to spend a little time in Warwick itself. You can exit the castle and have you hand stamped to allow re-entry. The castle is just a few hundred yards from the main shopping street, but there are lots of fascinating landmarks in the town to look out for. See this free guide to Historic Warwick for more.